Oatmeal is not just for breakfast any more. 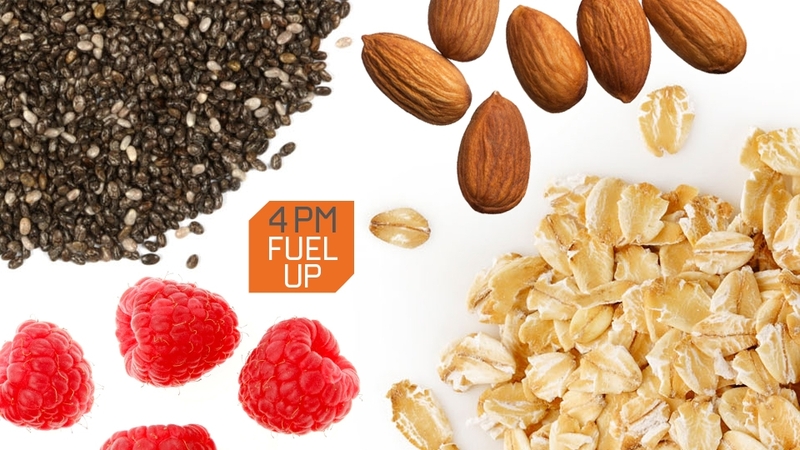 When you add extras such as chia seeds, raspberries, and almonds, you have the perfect 4 p.m. power food. This may be the most nutrient-dense snack on the planet and it hits all the high notes you’ll need to feel like Rocky running up the Phillie Art Museum steps, arms in the air, sound track blaring and ready to take on Apollo Creed. Bam. – The simple sugars in the raspberries are quick energy your body will access fast — the twigs, the kindling, if you will. – The complex carbs in the oatmeal are more slow-burning — the branches. – The omega-3 and other fats in the chia seeds are healthy fats that burn even longer — this will provide the logs, the basis of your fire. – The almonds deliver muscle-protecting protein — the oxygen you need to keep the fire burning. Trust that this snack is easy to whip up, super-complete, tasty, and trainer-approved. Put base ingredients into microwave-safe bowl and microwave at full power for 1½ minutes. Stir, and microwave for another minute. Mix in raspberries, almonds and agave syrup. Enjoy! Tons of omega-3 fatty acids from the chia seeds: chia has 8 times more omega-3 than salmon.